It’s easy to work up a thirst in the summer. You might be shooting hoops in the park, riding on a trail or playing volleyball on the beach. No matter what your favorite summertime activity is, outdoor fun can leave you dry—and then it’s time to reach for a cold one. But when your body craves hydration, what’s the best thing to drink? Sure, we’ve all seen those ads for so-called “energy” and “sports” drinks. But do you know what’s really in them? 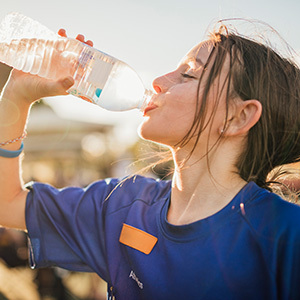 Sports drinks (all of those different “…ades”) are mostly water with some sugars, salts and acids. “Energy” drinks (often promoted as “dietary supplements” to avoid labeling requirements) also contain plenty of acids and sugars—and sometimes extremely high levels of caffeine! Studies have shown the acid in both sports and energy drinks has the potential to erode the hard enamel coating of your teeth, making them more susceptible to decay and damage. And the sugar they contain feeds the harmful oral bacteria that cause tooth decay. So you could say that the ingredients in these beverages are a one-two punch aimed right at your smile. It’s a similar story for sodas and other soft drinks, which often have high levels of sugar. In fact, some popular iced teas have 23 grams (almost 6 teaspoons) of sugar per 8-ounce serving—and a single 24-ounce can holds 3 servings! Many diet sodas (and some fruit juices) are acidic, and may damage your tooth enamel. Water, on the other hand, has no acid and no sugar. It has no calories and no caffeine. Simple and refreshing, water gives your body the hydration it craves, with no unnecessary ingredients that can harm it. In fact, if you fill a reusable bottle from your own tap, you may not only benefit from cavity-fighting fluoride that’s added to most municipal tap water…you’ll also be helping the environment by cutting down on unnecessary packaging. It’s best to drink water all of the time—but if you don’t, here are a few tips: If you want to enjoy the occasional soda or soft drink, try to limit it to around mealtimes so your mouth isn’t constantly bathed in sugar and acid. Swish some water around your mouth afterward to help neutralize the acidity of the drinks. And wait at least an hour before brushing your teeth; otherwise you might remove tooth enamel that has been softened by acids. What you drink can have a big effect on your oral health—and your overall health. So when thirst strikes, reach for a cold glass of water. It can help keep you healthy this summer…and all year long.